I saw my sugar glider holding and eating a crayon, I didn't know my grand baby threw 1/2 a crayon in the cage. The top of the crayon has some nibble marks on it and some small pieces missing. I couldn't find. vet to get her in today. Should I take her to a emergeny Hosp ? She is acting normal. Should I give her apple juice or something to help the crayon pass through her system ? Crayons aren't toxic, but can be an issue. Cooked unseasoned pumpkin is the best to help soften the stool. It's likely she just tasted it. But a visit to the vet is a good idea, just in case. Click on the word vet, and it will take you to a database where you may find one near you. If nothing else, see if you can talk to the vet. Thank you I will do that and thank you for the link. I am going to give her some and thank you very very much. I am going to move this to Health & Hygiene now. Please keep us posted on your little ones condition. 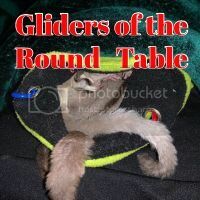 I think most gliders will taste something new.